Lived 460 BC – c. 370 BC. Hippocrates is regarded as the father of Western medicine. He systematized medical treatments, disentangling them from religion and superstitions. He trained physicians in his methods and, with his followers, is responsible for authoring a large body of medical textbooks. The famous Hippocratic Oath binds physicians to following good ethical practices. Hippocrates was born in 460 BC (the first year of the 80th Olympiad) on the island of Kos in Ancient Greece. Hippocrates was a common name in Greece, so to be certain of his identity, he is often referred to as Hippocrates of Kos or Hippocrates the Great. 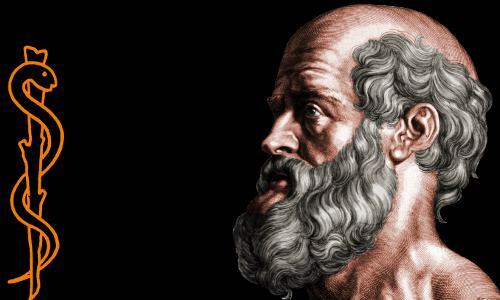 On a timeline of illustrious scholars, Hippocrates lived after Pythagoras; at the same time as Socrates, Plato, and Democritus; and he was still alive during Aristotle’s early life. What we know of Hippocrates’ life consists of fragments, such as a mention in Plato’s work Protagorus, where we learn that Hippocrates of Kos is the greatest of Greek physicians. In Plato’s Phaedrus we learn that Hippocrates is an acclaimed teacher who has his own medical doctrine. We can be reasonably certain this information is reliable, because it comes from Hippocrates’ own time and from the great city of Athens, indicating his renown had spread there. Most other information about Hippocrates comes from later sources and is of varying degrees of reliability. Some is thought to be reasonably reliable, such as that related by Soranos of Ephesus, whose second century AD account is based on earlier accounts by, for example, the great librarian, geographer, and mathematician, Eratosthenes. Some references, such as Letters from the Roman era, are regarded as dubious and will be ignored in this article. Hippocrates was a member of the Asclepiad family, an aristocratic family highly regarded as medical practitioners, with a proud history of serving Greece. His grandfather’s name was Hippocrates and his father’s Heraclides. His mother was Phaenareta, who was also from a noble family. Hippocrates, as tradition dictated, was trained by his father to be a physician. He began work on Kos and married a noblewoman whose name is unknown. The couple had two sons: Thessalus and Dracon, and a daughter, whose name is unknown. Thessalus and Dracon both followed family tradition by becoming eminent physicians. Hippocrates’ daughter married Polybus, a young man trained as a physician by Hippocrates. After his parents had died and his daughter had married, Hippocrates sailed from Kos to the Thessaly region of the Greek mainland, accompanied by his sons. Thessaly is where Hippocrates’ ancestors were born. His son-in-law Polybus took over Hippocrates’ medical work on Kos. In Thessaly, Hippocrates probably practiced in a number of cities researching one of his doctrines, that a person’s local environment affects their health. In about the year 420 BC Hippocrates met with ‘barbarians’ from lands to the north of Greece and learned about a plague affecting them. He considered the climate and wind directions and correctly predicted the plague would arrive in Greece and sent out warnings to Greek cities. 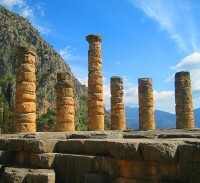 Delphi – remains of the Temple of Apollo, where the Oracle foretold the future. Now in his early forties, Hippocrates traveled around the cities of Greece treating the disease. His sons and pupils also did this. The city of Athens gave Hippocrates a gold crown for his work. The source of this information is Speech of the Envoy, written by followers of Hippocrates. There are no independent reports in Greece of a plague coming from the north at this time. The story could be factual though, because Speech of the Envoy also mentions inscriptions made about Hippocrates and his son Thessalus at Delphi, location of the famous Oracle, and such inscriptions do actually exist. 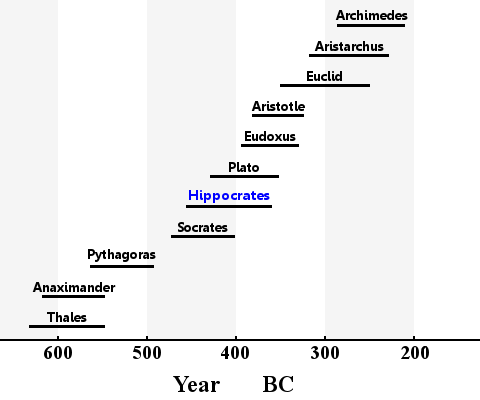 Hippocrates is often described as the father of medicine. He did not invent medicine: in ancient times the Egyptians were long considered the greatest physicians. 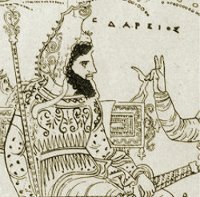 Darius the Great, ruler of a huge empire, shown on a Greek vase. However, after he suffered a dislocated ankle, his Egyptian medics made it worse; the pain was so bad Darius could not sleep. After lying in agony with no sleep for a week, he learned he had a Greek physician by the name of Democedes of Croton held captive. In desperation, he summoned the Greek to his court. Using gentler methods than the Egyptians, Democedes was able to soothe the pain, allowing Darius to sleep, and he then restored the ankle to full use. This marked a transition – the rise of Greek and the decline of Egyptian medicine. 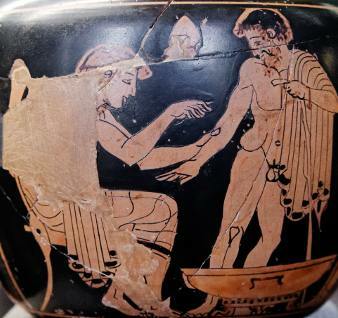 A Greek Vase from 480 – 470 BC, made one or two decades before Hippocrates was born, showing a physician caring for a patient. Photographer Marie-Lan Nguyen. an over-reliance on nature’s own healing power to cure illnesses: even in ancient times, this was criticized: Asclepiades of Bithynia in the second century BC described it as a “meditation upon death.” In the Hippocratic texts Epidemics I and III, of the 42 case histories reported, over half ended with the patient’s death. Hippocrates was in the vanguard of scientific medicine and therefore made mistakes which are entirely understandable. For example, we know that the Ancient Greeks were aware of desalination. No doubt Hippocrates was aware of the apparent goodness of evaporated water when he described an experiment on ice and meltwater. Hippocrates incorrectly believed that ‘the lightest, sweetest part’ of the water was lost in the process of freezing and thawing, leaving inferior water behind. He drew the false conclusion that drinking melt water was a poor choice for people seeking good health. We can only admire his belief in the power of experiments to reveal the truth, although on this occasion it led him to a false conclusion. The service Hippocrates did to science and health by disentangling disease from superstition cannot be understated. Trying to understand a disease using reasoned, logical explanations rather than blaming possession by an evil spirit, for example, was a critical step in human development. Rudolf Virchow established that the true cause of disease is malfunctioning cells. Louis Pasteur established the germ-theory of disease, showing cell-malfunction is in many cases caused by invading micro-organisms. Not all of the medical books attributed to Hippocrates were actually written by him – indeed there is no direct proof that he personally wrote any of them. Some or all of the body of 60 Hippocratic works were definitely written by followers of his doctrines, such as his son-in-law Polybus. Many of the works have been lost. Hippocratic medicine dominated the field for 500 years until it was it was absorbed and surpassed by Galen’s works. Hippocrates died and was buried in Larissa, Thessaly. He is said to have died in about the same year as Democritus, which would mean that – depending on source – he died at the age of 90, or possibly 104, or even 109. His sons, both trained as physicians by him, continued the family tradition by training their own sons to be physicians; both also named a son Hippocrates. In historical works, the subject of this article, Hippocrates of Kos, is often referred to as Hippocrates II, his grandsons as Hippocrates III and Hippocrates IV, and his grandfather as Hippocrates I. After Hippocrates’ death, a cult was established on his home island of Kos. Hippocrates was given divine status, with sacrifices made on his birthday. Whether Hippocrates, a rational scientist, would have approved of this we cannot be sure. "Hippocrates." Famous Scientists. famousscientists.org. 27 Jun. 2017. Web. Image of Greek Vase by Marie-Lan Nguyen under the Creative Commons Attribution 3.0 Unported license.